This entry is part 1 of 3 in the series Masonry in the Church? ‘Freemasonry is Satan’s Trojan horse, and it is in the Church of our day; and all too often people won’t listen to the warnings which are being sounded’. Pierce Dodson, Baptist Pastor. 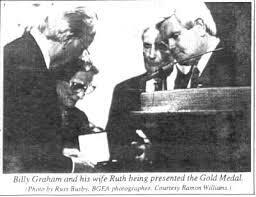 Billy Graham & wife Ruth receiving medal from 33° Freemason Newt Gingrich & 33° Freemason StormThurmond. Check here, & here. This entry is part 2 of 3 in the series Masonry in the Church? The following is a picture and excerpt from the ‘Satanic Bible’: (We pray protection for the viewers in the name of Jesus Christ, the son of the living God). The only purpose of this pictures is to expose the enemy & his works of darkness. This entry is part 3 of 3 in the series Masonry in the Church? A number of converted witches are going about the country today, warning that Satanists and practicing witches are infiltrating the church — especially charismatic churches. Some of these former witches have authored books telling of a diabolical plot by evil witches to enter congregations posing as super-spiritual Christians. Their purpose is to deceive and shipwreck pastors and to lead multitudes of naive believers into occult worship. Many of these evil witches, they say, are already firmly established in numerous churches, controlling both the pastor and congregation and causing great confusion, wickedness, divorce — even death. We have received many letters in our office from people who say they believe their pastor must be under some kind of demonic influence — and I believe many of these letters are very legitimate.